ICFO reaches out to all ages through books and other publications that aim at immersing readers in the fascinating world of photonics. lluminado and Lucilda is a series of tales for children accompanied by adults (or adults accompanied by children) showing the basics of photonics. They feature a strange couple formed by an atom who writes verses and the Queen of Photons, in a continuous search for a peaceful and beautiful universe. The stories in this collection describe a universe that is not working properly because the light and matter are not willing to behave. The Empress Lucilda aided by Iluminado, the enlightened atom who is a poet and madly in love with the Empress, look for ways to create a world with a balanced relationship between light and matter, a bond that makes possible wonderful things. lluminado is an atom, and also a poet, living in a universe where matter is afraid of light. He realizes that light is the inspiration for his art and understands that Lucilda plans to banish all fear from the atoms. He decides to help her and to never leave her alone again. Another failed attempt by Lucilda to make a rich and fertile universe. In this universe, light and matter play non-stop to create parties and lasers. The laser beam is “a good solution looking for problems”… But in this universe there are no problems! Lucilda must start all over again. Laura and Joan are two children with magical powers who occasionally participate in some very interesting research travelling around Catalonia… But the magician who came out of the magic lamp made them promise that the magical powers could be used just for a couple of days… Check out what happened when they came to ICFO. 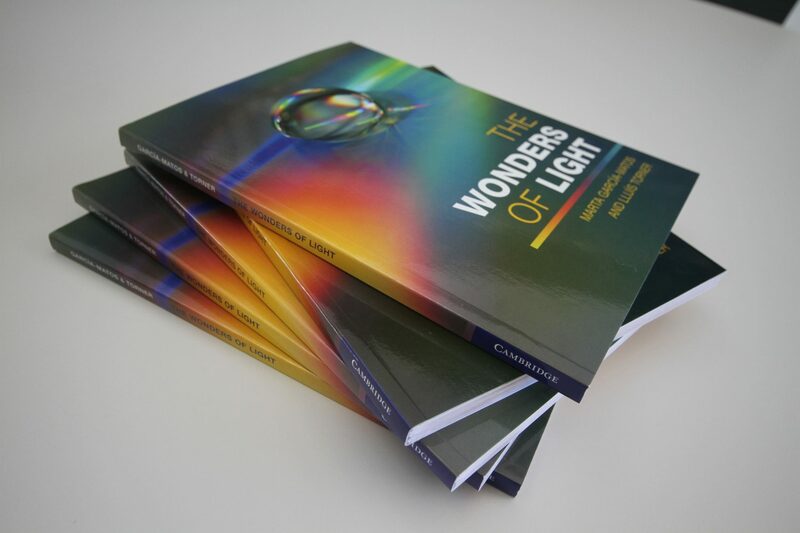 A book for young adults and adults dedicated to discover the amazing powers of light. With an eye-catching design and understandable writing style, the book describes light as an enabling tool in areas as diverse as health, communications, security, environment, clean energies, and future quantum technologies, among many others.